Eight months from Election Day, it is already a nip-and-tuck Presidential race. 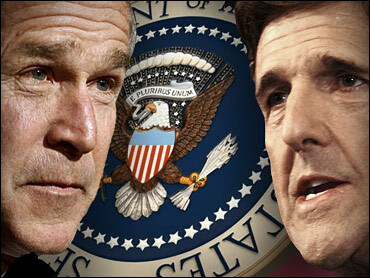 George W. Bush currently leads John Kerry by three points among voters, while two weeks ago Kerry was up by one. Seven in ten of each candidate's voters say they have already locked in their choices, and most voters already have clear opinions of the two presidential candidates' qualities and their potential strengths and weaknesses in office. Much of the electorate has already made its decision. 71 percent of voters backing Kerry or Bush say their minds are made up now. American voters are about evenly split in their views of President Bush, with slightly more viewing him favorably than unfavorably. Senator John Kerry, though now heading up the ticket for the Democrats, remains unknown to many voters. Like Bush, he receives mixed reviews from those who are familiar with him. Most voters -- 79 percent -- are paying at least some attention to the campaign now, which is roughly the same number who were doing so at this point in 1996, and more than were paying attention in March of 2000. Many voters now offer views on both candidates, though fewer offer opinions of Kerry than Bush. Majorities of voters describe both Bush and Kerry as strong leaders, and both are seen as having a vision for the country. Both also are viewed as sharing the moral values most Americans try to live by, but Bush has an advantage over Kerry in this area, and Kerry is more unknown in this regard. Kerry has an edge over Bush in being seen as caring about voters' needs and problems, though majorities have positive views of both. Voters are less positive in their assessments of both candidates on some other characteristics. More than half -- 52 percent -- of voters say Bush does not share their priorities for the country, while 45 percent say he does share them. 43 percent think Kerry does not share their priorities, while 41 percent say he does. Again, Kerry is more unknown: 16 percent were unable to rate Kerry on this question, compared to only 3 percent who could not rate Bush. In assessing the candidates' public statements, half the voters think Bush says what he believes most of the time, but 45 percent think he says what people want to hear. Evaluations of Kerry are much less positive on this count. 57 percent think he just says what people want to hear, while 33 percent think he says what he believes. Bush continues to be perceived as a conservative: 53 percent describe him as such. 39 percent of voters view John Kerry as a liberal, and three in ten say he is a moderate. One in ten voters thinks Kerry is a conservative, and 20 percent are unable to identify Kerry with an ideology. Key issue areas in this presidential campaign continue to be terrorism (along with the war in Iraq) and the economy and jobs. Voters are more confident in Bush than Kerry when comes to handling an international crisis, but they express more confidence in Kerry when it comes to the economy. 53 percent of voters are confident in Bush's ability to handle an international crisis, while 46 percent are uneasy. Looking to the Democratic nominee for president, voters who hold opinions are more likely to be uneasy about Kerry's ability to handle an international crisis than they are to be confident: 48 percent are uneasy while one-third are confident, but one in five voters are not yet able to offer any opinion about Kerry on this. However, when it comes to making the right decisions about the nation's economy, 57 percent of voters now say they are uneasy about Bush's approach. Only 39 percent say they are confident. Kerry does better than Bush in this area, though voters are divided about him. 43 percent say they are confident in Kerry's ability to make the right economic decisions, but nearly the same number (42 percent) are uneasy about his approach. 15 percent of voters, however, are not sure. Other questions show this split between evaluations on foreign policy and evaluations about the economy. A large majority of voters express confidence that Bush will protect the country from a terrorist attack if he is re-elected in November, but many voters do not think a second Bush term will create more jobs or make sure Social Security benefits remain available. Half of voters think Bush is not likely to increase the number of jobs if he is re-elected. 47 percent say he is likely to make sure Social Security benefits are there, but 43 percent say he is not. If he unseats the incumbent and is elected president in November, majorities of voters think John Kerry will protect the country from a terrorist attack -- though there is less optimism here compared to Bush -- make sure Social Security is solvent, and increase the number of jobs in the U.S. As on many other questions, more voters were unable to rate Kerry on these issues than were unable to rate Bush. As for the future of the economy overall (which voters sometimes view as outside any President's complete control) the differences between Bush and Kerry are less distinct. 43 percent think the condition of the economy will stay the same if Bush is re-elected, three in 10 say it will get better, while 23 percent think it will get worse. If Kerry wins in November, 42 percent think the economy will say the same, but 36 percent say it will get better. Only 11 percent say the economy will get worse under a Kerry administration -- half the number that says this about a second Bush term. Compared with the CBS News Poll conducted two weeks ago, this poll has other mildly positive news for the President: his approval rating has crept back to 51 percent now, up from its low of 47 percent in late February. Nearly two-thirds approve of how Bush is handling terrorism. However the President continues to receive far lower marks for handling the economy and foreign policy, and just under half approve his handling of Iraq, also up slightly from 46 percent two weeks ago. 53 percent of Americans believe Bush is in charge of what goes on in his Administration, and 38 percent say other people are.